Paige Bjerkaas is a name familiar with many disc golf fans, but it’s not a name we always see on tour. 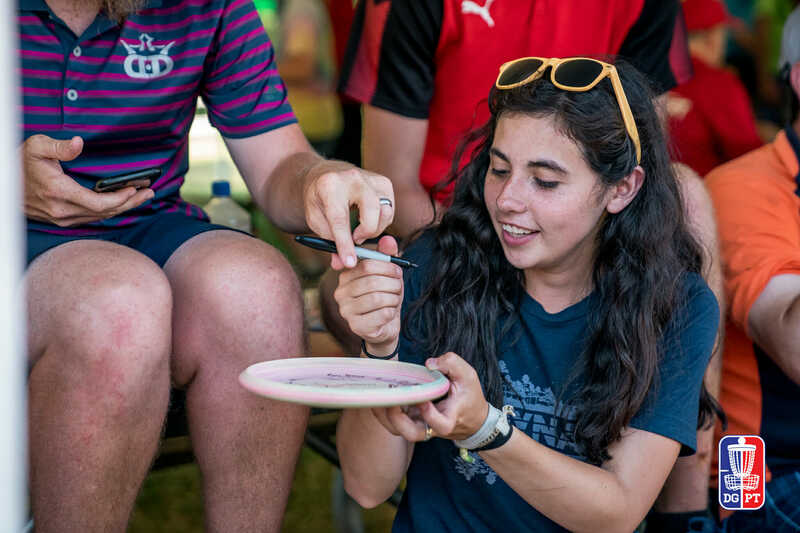 The college student can often be found in Emporia, Kansas working at the Dynamic Discs store, except during the summer months when she’s on the road hitting as many tournaments as possible. We caught up with Bjerkaas after the Utah Open to see how the touring life was going. She’ll be in action again later this week at the Idlewild Open. Ultiworld Disc Golf: We wanted to catch up after you’ve been on your tour this summer. We’ll get right into it: you set out in May for a bit of a mini-tour correct? Paige: Yeah, during the summer because I’m at school in the spring and fall. UWDG: You’ve pretty much been following all the major events on the west coast swing and working your way back across to the Midwest. Is this generally what you prepare for during the summer? Paige: Yeah, I’ve actually toured every summer since I was 16 years old except last summer. Last summer was the only exception, but I typically save up money during the school year and try to practice as much as I can to then hit the road. UWDG: Did you set off by yourself this year or are you touring with someone? Have to split drive times and all that kind of stuff. Paige: I do have a touring partner, her name is Amy Vrana, and actually she joined me at the San Francisco Open. I actually played Masters Cup by myself, which was the weekend before and then she flew in to San Francisco. We played every event together since then. UWDG: And she’s sticking with you through the Great Lakes Open. Is that your last event on the calendar for now? Paige: I do have time for a little, I think another four-week trip, but unfortunately Amy can’t travel with me so I’m kind of working on finding someone right now. But I’m definitely going to be a GLO for sure. I’m just not sure what my schedule looks like after that. Editor’s note: Bjerkaas finished quite well at the GLO, taking second place and $980 in winnings. That gave her a boost to stay on tour a bit longer and she’ll be competing this weekend at the Idlewild Open. UWDG: How did you and Amy link up? Is she also from Kansas or Colorado, or just someone you know from the scene? UWDG: How is it sharing the road with somebody? Do you usually have a partner during your summer tour or have you gone solo in the past? Paige: I always have a partner. It is so awesome to have someone to split expenses. Obviously, that’s the most beneficial part, but it’s just cool to have a friend and to see each other grow in our games. You know, seeing ratings updates, seeing us get better at these courses, our putting, and driving. So it’s awesome. I don’t like to travel alone. I drove from Emporia to Santa Cruz by myself, which is like 28 hours. Incredibly hard. So it’s always awesome to have a partner. UWDG: I’m sure. How do you fill the time when you’re by yourself driving that long distance? Paige: Music — listening to a lot of music, and the only way to stay awake is to sing along with it. And Five Hour Energies, those are clutch too. UWDG: What’s the preferred soundtrack? Paige: Oh my gosh. Well, my favorite album of all time is Licensed to Ill by the Beastie Boys. So that was an album I had on repeat a lot. UWDG: There’s a good YouTube video out there of you doing a little Beastie Boys cover. Paige: Oh gosh, yes, yes. [laughs] There is a video of me that I am not proud of. That was eighth grade, 13 or 14-years-old. UWDG: Classic. You’ve pretty much had a tournament every weekend since late April, so how are you feeling? It seems kind of like not only are a lot of your results been ticking up, but your round ratings all seem to be rising the longer you’ve been on the road. Is that getting back into the swing of things or is it? I would have thought touring nonstop for that long might be causing some fatigue, but it seems like you’re getting more confident. Paige: That’s tough. I mean it is extremely tiring, but I think you said it correctly. Getting into the swing of things and I’m just gaining the confidence. I didn’t even cash at Masters Cup but I’ve cashed at every event since. With school and work, it’s kind of hard to find time to practice a lot. So the fact that I’ve been playing almost every single day nonstop — I mean that’s why I’m improving because I’m just throwing. Throwing and putting. I haven’t had a weekend off to come back and get a break. It’s tiring, but for my game personally, to play all the time, almost every day, it’s beneficial. UWDG: Sure. How long do you have left in school again? Is it one year, two years? UWDG: You’re going to plan on doing the same thing next summer, I assume, and then what’s the plan two years from now when you’ll be graduated? Paige: So yeah, the plan is to just keep touring in the summer. So I guess next summer would be my last summer tour, but, you know, right now I’m leaning towards just touring full-time and having my degree as a backup. That’s kinda the plan right now — but who knows. I’m studying to be a teacher so I could find a great job and then do exactly what I’m doing now, teach during the school year and tour during the summer, because that’s actually what Amy does. She teaches middle school. So I’m not sure. But right now I really…I dunno, I feel like there’s a lot of potential if I fully commit. I mean I’m doing pretty well right now and I don’t even do this full-time, you know. So it’s just so exciting to know if I was on the road the whole time, and I had the offseason to really practice instead of doing homework and studying, what could I do. I don’t know, but right now I think I just want to play disc golf this summer, see what I can do and just keep going from there. UWDG: I’ll lean right into it: sounds like you want to give it the good ol’ college try when you’re done with school. 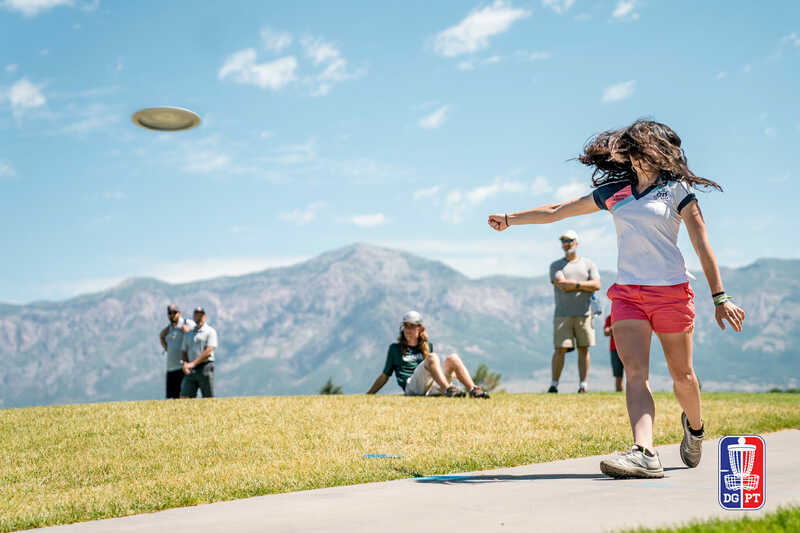 UWDG: A lot of different women have been jumping on the commentary this season, with the new opportunity presented by the Disc Golf Pro Tour’s initiative to broadcast the Open Women same-day before their live broadcast. 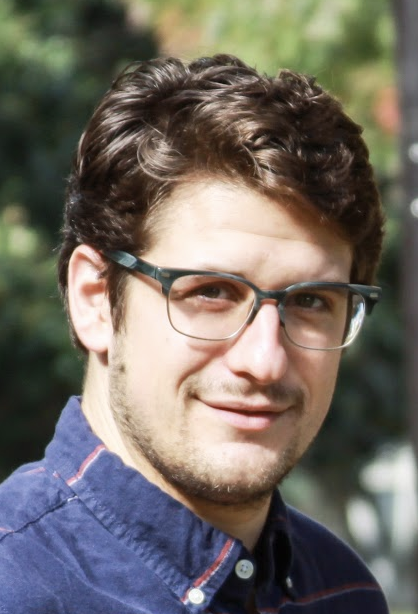 Do you have any interest in doing some commentary? Paige: Okay, I had never done commentary. Nobody had ever asked me [increduslously]. Several women had gone multiple times, so finally the last day [of Utah Open] I was asked to do it and I was super excited and I think I did pretty well. I tend to talk a lot, so there wasn’t much silence when Amy and I were doing it together. It was super fun and I would love to do it again…and again and again. UWDG: Anything else you were very excited about being on tour, just enjoying your summer as it is and getting on the road? Is it kind of like a reunion when you’re seeing a lot of these people? I guess you see them when they stop in Emporia for Glass Blown Open, but what’s it like being back on the road with everybody? Paige: It is like a reunion because I work at the retail store in Emporia and a lot of the pros don’t go to the retail store [at GBO] because not everyone sponsored by Dynamic Discs or Trilogy. So I don’t really get to see anybody because I’m incredibly busy. And then the men played the country club this year and the women played different courses. So it’s cool to see the women, but it’s been so nice to catch up with some guy friends and just hang out. It’s kind of, you know, my two lives. I have my school life and my disc golf life. So it was so cool to reunite with them and to catch up. UWDG: Are there any shots you’ve gotten on camera, during tournament footage, that you were especially excited about? Paige: Gosh, I didn’t even do anything special. I just played super conservatively. Hole four [at Utah], during the last round where I threw my shot and I hit the top of the basket. Other than that, I was super conservative. I guess hole 15 of the last round, the one where I took a three and everyone else got to five or worse. That was a super hard hole. It was cool to get that hole. And it was great to see my upshot on that hole to get captured on camera because I had to put it just over the water and it’s kind of a risky shot, but it paid off. UWDG: Hopefully you’ll get on more covered cards and we’ll see you on video with a nice throw-in or something like that. Maybe next time that hole four approach will go into the chains instead. Comments on "Q&A With Paige Bjerkaas"